Sub:- School Education - Celebration of international day of the Girl Child Organize programmes on child safety awareness on mission mode between 9.00 a.m to 11.00 am on 11-10-2017 – Instructions Issued – Reg. Ref:- 1. Proc of the Commissioner & Director of School Education, TS, Hyderabad, RC.No 564/PS.3-1/PED/2017-2 dt: 05.10.2017. All the Mandal Educational Officers and all the high school Headmasters of all managements in the district are hereby informed that in the reference cited, the Commissioner & Director of School Education, Hyderabad has informed to Celebrate International day of the Girl Child Organize programmes on child safety awareness on mission mode between 9.00 a.m to 11.00 am on 11-10-2017 and instructed to conduct special programmes on compaign mode as indicated below. 2. Protection of children from sexual abuse and exploitation. 3. Elimination of child labour. 4. School is right place of education (Compulsory Elementary Education). 5. Swatch Pathashala - Swatch Telangana. a. Take out processions with placards and slogans. dissemination of information on the above subjects after procession. c. Conduct competitions among teachers and students. 6. Conduct District level/Mandal level meetings with all stake holders and involve them for successful conduct the programme on mission mode. All the Mandal Educational Officers and all the high school Headmasters of all managements are requested to organize celebrations of International day of the Girl Child Organize programmes on child safety awareness on mission mode between 9.00 a.m to 11.00 am on 11-10-2017 and Organize the programmes as per the instructions of the Commissioner & Director of School Education, TS, Hyderabad and submit report on the Competitions/ activities conducted on the programme and action taken report by 12.10.2017 through whattsapp and email without fail and the expenditure on the programme can be met from the School grants already released to the schools. This should be treated as Very important. BACKGROUND AND INTENT: Cases of sexual abuse against children have increased over the years with devastating effects on children. Children feel significant distress and display a wide range of psychological symptoms, both short- and long-term. They feel powerless, ashamed, and distrustful of others. Recognising the urgent need to mobilise action against sexual abuse of children and thereby to Make India Safe Again for Children, Nobel Peace Laureate Shri Kailash Satyarthi, the Satyarthi Movement and the Kailash Satyarthi Children’s Foundation is currently undertaking Bharat Yatra. PURPOSE BEHIND THE LESSON: Acknowledging that there is great paucity of information, knowledge and understanding regarding child protection in India, there is an urgent need for children to become empowered, so that they can protect themselves and other children. Rooted in the idea that India needs a radical, social revolution so it can transform into a child-friendly country where every child is free, safe, educated and healthy, the Kailash Satyarthi Children’s Foundation has developed a thirty minutes module on child sexual abuse to be delivered to children across the country by their respective school teachers. The module is based on the primary tenets of child protection with a focus on sexual abuse and its prevention. The Module focuses on basic skills children should know in order to protect them from abuse. It also includes some key elements of the principal law in the country to address child sexual abuse – Protection of Children from Sexual Offences Act, 2012. The Module for the three age groups is attached. While enclosing herewith a copy of the letter read above, all the District Educational Officers / MEOs/ HMs in the State are requested to take further action in the matter. 1. As you are aware, !he. cases of sexual abuse against children have increased over the years with devastating effects on children. Children feel significant distress and display a wide range of psychological symptoms, both short- and long-term. They feel powerless, ashamed, and distrustful of others. 2. Recognising the urgent need lo mobilise action against sexual abuse of children and !hereby to Make India Safe Again for Children. NobelPeace Laureate Shri Kailash Satyarthl Is currently undertaking Bharat Yafra covering 11,000 krns across 22 stales of the country. The Yatra was flagged· from southernmost tip of lhe country, Kanyakumari on 11 Sep'17 and has already covered seven states reaching out to Chief Ministers, Cabinet Ministers, government officials, judiciary, religious leaders and thousands of children and adults. The motto for Bharat Yatra is 'Surakshit Bachpan, Surakshit Bharat' or 'Safe Childhood Safe India'. Through this Yatra we are aiming at sensitising and engaging more than one crore people to pledge against the menace of violence against children. 3. As part of the Bharat Yatra, Shri Kailash Satyarthi will conduct a class of 11,000 children to sensitize and educate them on sexual abuse and its prevention in Jaipur on 11 Oc!'17. As a commitment towards children-of your Stats and also express your solidarity towards the cause, we request that schools in your State also conduct similar class with students on the same day. The schools may organize the class between 9:00 AM to 10:00 AM on 110ct'17 and strengthen their support towards the protection of children from sexual abuse and exploitation. We will provide the teaching material for schools in simple language to be delivered by the teachers of respective classes. 4. We look forward to your support and request you to issue a directive to all schools in our te to or anize a Lesson on Child Safety Awareness. We are confident that your commitment owar s the protection of children will he p ·in ensuring a safe and secure childhood and break the unacceptable silence about child sexual abuse, exploitation and child trafficking. 5. We shall coordinate with your office to provide any further information or clarification.For any support please feel free to contact Mr. Ashutosh Mishra - 9717022344. 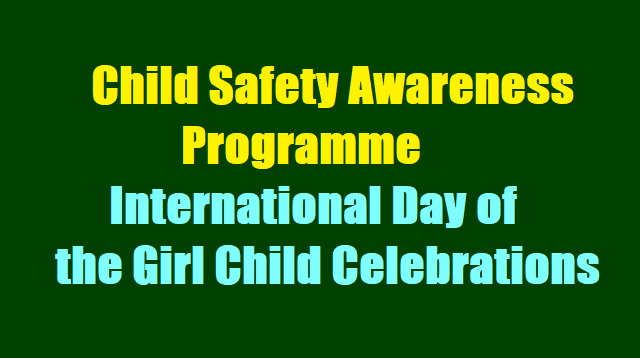 Sub:- School Education - Celebration of International Day of the Girl Child - Organise programmes on child safety awareness on mission mode between 9.00 a.m. to 11.00 am on 11-10-2017- certain instructions - issued - Reg. All the District Educational Officers in the State are directed to issue instructions to all the Schools in the State under all managements to organise programmes in the School on child safety awareness between 9.00 a.m. to 11.00 am on 11-10-2017. The following activities are to be conducted. l) Take out processions with placards and slogans. 2) Head Masters I Teachers should explain the important issues & dissemination of information on the above subjects after procession. 3) Conduct competitions among teachers and students. 4) Use the Material / guidelines provided by Kailash Satyarthi Childrens Foundation which are already furnished to the DEOs / MEOs. All the District Educational Officers are requested to conduct District level/Manda[ level meetings with all stakeholders and involve them for successful conduct the programme on mission mode and furnish report on the Competitions / activities conducted on the programme and furnish action taken report by 12-10-2017 through whatsapp and email without fail. The expenditure on the programme can be met from the School grants already released to the schools.